In a continued effort to generate income, I will now be experimenting with providing jokes without their punchlines and stories without their endings. Starting today, punchlines and story endings are considered “premium content” and available for $1.00 each or at a reduced rate for monthly or annual premium content subscribers. 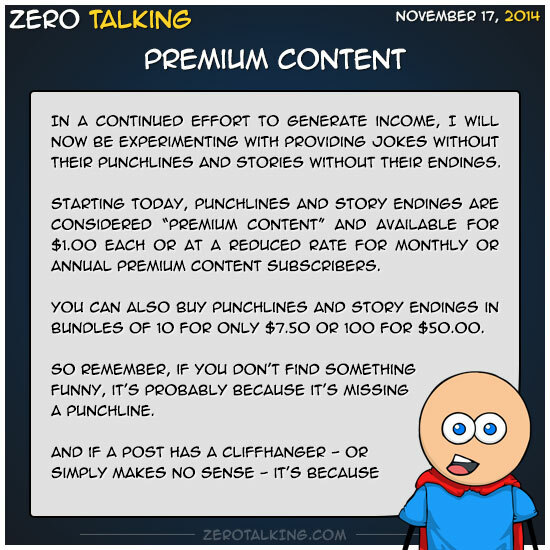 You can also buy punchlines and story endings in bundles of 10 for only $7.50 or 100 for $50.00. So remember, if you don’t find something funny, it’s probably because it’s missing a punchline.